TACTICAL COMBAT CASUALTY CARE - TCCC is a classroom, PowerPoint, realistic practical scenarios that are PHYSICALLY DEMANDING, instructor-led course from the from the National Association of Emergency Medical Technicians which are fully compliant with the Department of Defenses's Committee on Tactical Combat Casualty Care (CoTCCC) to teach TCCC-Medical Providers and TCCC-All Combatants. The TCCC course is designed to introduce evidence-based, life-saving techniques and strategies in order to provide the best trauma care on the battlefield or in hostile incidents. The TCCC course is taught under the auspices of the PHTLS program, recognized world-wide as the leader in prehospital trauma education. The TCCC-MP course is geared toward those combat EMS, military personnel, medics, corpsmen, and pararescue personnel deploying in support of combat operations or hostile events. The TCCC-AC is for those non-medical military personnel and includes first responders skills appropriate for soldiers, sailors, airmen, and marines. 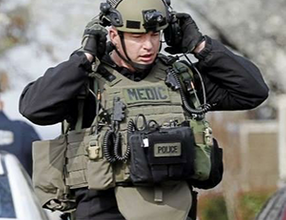 * Tactical Evac Care: Treating individuals while they are being evacuated from the incident site. The program also excces the 2015 amendments to the California Cod of Regulations, Title 22, Division 9, Chapter 1.5, Article 3, § 100017 (14) and CA H&S §100017(14)(A) for individual first responder training as a State of California Advanced Tactical First Aid Course (Fire/Law/EMS). PREREQUISITES: Both courses are PHYSICALLY DEMANDING! Prospective applicants will be expected to lift heavy objects, function in confined spaces, under low-light visibility, extreme noise, and required to move and/or communicate under stressful conditions. STUDENT ATTIRE: Attendees are encouraged to wear the clothing that best represents the attire required for their job. There is FIELD TRAINING, and attendees SHOULD WEAR clothing to ACTIVELY participate in REAL-WORLD SCENARIOS as the clothing WILL get SOILED with DIRT / MUD, ARTIFICIAL BLOOD, and POSSIBLY WET (depending on the weather). COURSE FORMAT: This classroom, realistic practical scenario based includes instructors, PowerPoint, Video, Physical and Live tissue skill(s) interaction throughout the course. This course is a 16-plus hours course that covers the topics that are orientated to civilian tactical medical providers and is fully compliant with the recommendations of the Hartford Consensus I, II, III and IV, the CoTECC standards and the foundational principles of Tactical Combat Casualty Care. 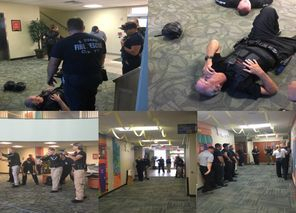 CERTIFICATION: Upon completion of the course, students will receive a NAEMT Tactical Combat Casualty Care (TCCC) certification valid for 4 years and 16 hours of CMEs/CEUs. California Law Enforcement may submit POST-2-213/213A for CPT credit. Texas Law Enforcement Officers who have their commission are eligible for up to 20 hours of TCOLE credit hours. If you represent a government, state, or county service our scenarios can be customized to your needs. This course scenarios have the ability to become tailored to your departments needs.